Interesting press release from the AICPA. Times are changing and changes need to happen. The CPA Evolution Working Group, which is having its second meeting today, was formed by the National Association of State Boards of Accountancy (NASBA) and the American Institute of CPAs(AICPA). Last week, Daniel Hood, Editor-in-Chief of Accounting Today, wrote a great article covering a presentation by Mark Koziel, of the AICPA, at the recent ENGAGE conference in Las Vegas. Among the most important ways the profession will need to change will be to move up from services and activities that rapidly being automated. “Technology could automate 49 percent of current activities,” he warned. “Data processing and bookkeeping have a higher percentage chance of being automated, versus managing others and applying expertise – and that’s what CPAs do: We apply expertise. That’s less likely to be automated. Analyzing and interpreting data is where it’s at – not the low end of data entry,” he added. Read the entire article here and share it with your partners and team members. The key to success and change management is learning, then unlearning, and then relearning. The Journal of Accountancy has a podcast titled, How Tax Reform – and Excel – Are Changing The CPA Exam. It is hosted by Chris Baysden of the AICPA. Tax reform will have an important impact on many aspects of the accounting profession — including the CPA Exam. In this week’s episode of the podcast, we talked to Mike Decker, the vice president of examinations at the AICPA, about the changes being made to the exam as a result of tax reform — and about how Excel will now be available for use on the test. How the AICPA’s exams team has gone about collecting feedback on the exam. Why continuous testing could be on the horizon. The timeline for implementing changes due to tax reform. How and why a practice analysis will be initiated. The changes that test takers will see to monitors and software used in the exam. Here’s a link to the podcast (it’s only 11 minutes long). You need to know so you can advise and encourage the young accountants in your firm to take the Exam and get it behind them! Want to know what’s going on with small, medium and even some larger firms? Check out this video from Mark Koziel. You probably know Mark well, but in case you don’t, Mark is Executive Vice President – Firm Services for the American Institute of CPAs. He leads the Private Companies Practice Section (PCPS), Firm Relationship Management, Small Firms, Diversity & Inclusion, Young Member Initiatives, Technical Hotline and Center for Plain English Accounting. Barry Melancon spoke at the BDO Alliance conference this week. Daniel Hood, Editor of Accounting Today communicated many great points from Melancon via Twitter. Twitter is often a great way to learn things – I hope you have a Twitter account and follow @AccountingEdit (Dan Hood) and @CPAmanagement (me). Here are some of Hoods tweets from Melancon’s presentation. This is IMPORTANT information so you can better lead your firm into the future. For those of you who believe the profession can be insulated from change, that’s a false optimism. Once AI, blockchain, etc. become accepted, they will completely redefine what we think a professional accountant is. Technical skills are table stakes. Finance execs want tech skills, communications skills, and critical thinking/ judgment skills. Technology and the law are changing what tax compliance means. What the world wants now is a combination of tax compliance and tax planning. Tax reform gives us a great opportunity to reposition ourselves this way. The number of U.S. accounting grads hired into public accounting dropped 20% in the last 2 years. But overall hiring at firms was flat – they’re hiring fewer accounting grads. In 2017, a quarter of all CPA firm acquisitions were of non-CPA firms. The digital age in transforming organizations from the traditional pyramid model to more of a diamond, with automation and outsourcing removing a lot of the entry-level staff. We need to start thinking about ‘fat middle’ firms, with more skilled middle-level employees than entry-level staff. In terms of new skill sets, we’re most concerned about mid-career people who need to unlearn what they’ve already learned. The notion of measuring CPE by the hour has to go by the wayside – it’s not about the hours, it’s about the skills learned. The quality of one's life depends on the quality of attention. Whatever you pay attention to will grow more important in your life. Different – Bold – Fast! 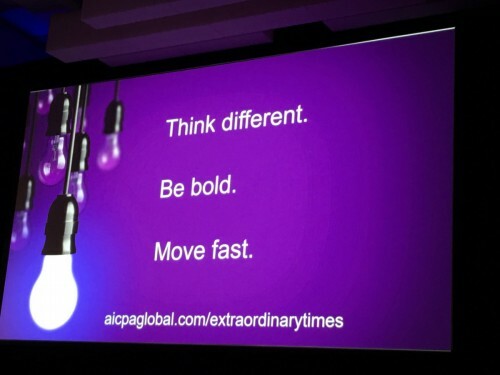 Thank-you to Lisa Simpson, Associate Director – Firm Services AICPA for posting this picture from the AICPA Digital CPA Conference back in December. If there is any other advice for CPA practitioners right now, it pales in comparison to these three statements. Many of my clients are smaller firms. I think “Move fast” especially applies to them. That doesn’t let the larger firms off the hook. My larger, multi-partner firms need to also take these three statements to heart. I see “Think different” happening in many firms right now. But, being bold and moving quickly are lagging behind. Adopt these three statements as your firm’s internal motto, a motto that will take your firm into the future. Make posters and put them up around the office. Make a screensaver using these three. Discuss the three statements at each partner meeting. Are we thinking differently enough? Are we making bold decisions and taking bold steps? How can you help us move faster? The AICPA Women’s Initiatives Executive Committee recently released the results of their 2nd annual CPA Firm Gender Study. There has been little change. Women still make up less than one-quarter of partners in public accounting firms. As usual, the smaller the firm, the more female partners. Here’s some info from the Executive Summary but I urge you to review the entire report and share it among your partner group. 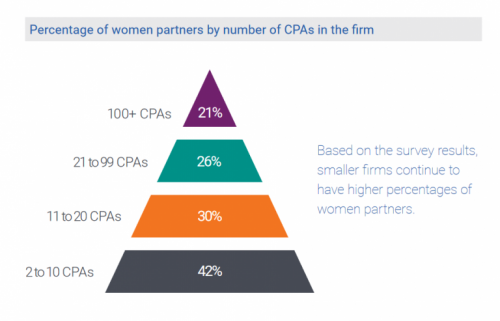 Partnership on average remains overwhelmingly male, with women representing only 22% of partners in CPA firms. A growing percentage of women are serving as directors or non-equity partners. Only 47% of firms have a formal succession planning process and only 2% include a formal gender component in their plans. Flexible work hours are the most popular program, followed by reduced hours and telecommuting. Women are key to succession for male partners. Make sure your firm is working on, or already has, a plan to help women (and men) to become future owners of your firm. Here’s a link to the members of the AICPA Women’s Initiatives Executive Committee members. Maybe someone from your firm should volunteer for the committee. Washington (Oct. 12, 2017) – The American Institute of CPAs (AICPA) is offering a tax reform webcast on Wednesday, Oct. 18 from 1 p.m. to 2 p.m. EDT. The audio webcast features Edward Karl, CPA, CGMA, AICPA vice president of taxation, and Melissa Labant, J.D., CPA/PFS, CGMA, AICPA director of tax policy and advocacy. Entitled Tax Reform: What CPAs Need to Know, the webcast is intended to brief participants about the latest tax reform developments and prospects for passage. One CPE credit is available for the webcast. It is $59 for AICPA members and $69 for non-members. Group registration is also available. Those interested may register at http://tinyurl.com/y9q9nd8n. Education is not the filling of a pot but the lighting of a fire. Firm leaders are always faced with multiple priorities. Probably, two of the most prominent are hiring and retaining top talent and taking great care of current clients. Leaders are also often deeply engaged with a new client pursuit. Your rainmaker partners truly love the pursuit and sometimes pay more attention to prospects and new clients than they do to their long-time loyal clients. There is another priority that needs attention. In a recent article via the AICPA CPA Insider, How to engage next-generation clients, Jennifer Wilson of Convergence Coaching, reminds practitioners of the massive generational shift that is happening over the next several years within their own client community. Many firm leaders have not developed strategies to deal with this client leadership transition to a younger, more tech savvy generation. It is time for firm leaders to add this priority to their list – more focus on next generation clients. Wilson not only addresses what next-gen clients value, she also gives practitioners six “first steps” to begin appealing to and attracting these clients. First we are children to our parents, then parents to our children, then parents to our parents, then children to our children.